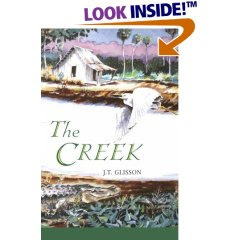 Couple of Sundays ago one of the men in the church gave me a book, The Creek by J.T. Glisson, to read. He knew that I needed a book to help me escape for a while. This is a true story about life in Cross Creek, Florida during the 1930's and 1940's. It is about the way of life for a Florida Cracker. Good read! I laughed and at times was sad. It made me think of the stories of my father and grandfather in South Georgia. Last night my wife encouraged me to go to the Sunday night service at a fellow pastor's church (They were having a special speaker - Bishop Ken McNatt). She said she thought I just needed to get out and maybe God had something for me to hear or experience. Well, she was right. Bishop McNatt spoke about Joash being hidden in the Temple for years and at the right time he was brought out and crowned King. Man did it hit home. That is just how we have felt. Like we were hiding out just biding our time for whatever was going to happen. Bishop McNatt said that there were some there in the service that God has had to hold back to prepare you for what is ahead. Now the appointed season was here. Now was the time to be released. I sat and cried because God was using this Pentecostal/Charismatic Bishop to speak the Word of the Lord to me. Things that I had been sensing and writing in my journal were being said by the Bishop. We have now entered a new season and a new day. The work in St. Augustine is being taken out of the cave to impact people's lives. It's not about us - it's about the Kingdom! What to do when you are in prison. Today's appointed reading was about Paul and Silas when they were thrown into jail. These guys were doing the right thing in preaching the Good News and there was a demon possessed girl that was following them. She was yelling and telling everyone that they were from God with the message of salvation. Paul finally got tired of it and commanded the demon to leave her. At his command the demon left and she received deliverance from the torments of this demon. She was a slave and her master was really upset because he was not going to be able to make money off of her any longer. The slave owner stirred the people up and Paul and Silas were beaten with wooden rods and thrown into jail and had their feet put in stocks. 1. Sometimes bad things happen when we are doing the right thing. This is just reality. We have to accept it because we live in an imperfect world. 2. The problem is not that something bad happens, but what we do when it happens. There is an improper response. That is to try to get even and take your revenge. This never works. It just keeps us bound to the stuff. Then there is an proper response. 3. The proper response is to praise and worship God in the midst of the bad. What did Paul and Silas do in the midst of the jail? They sang hymns and worshipped God. Now, this is not the natural reaction for us. We would much rather fight, cuss, or get revenge. But as you look throughout the Bible, we see people who were in a really bad situation that God told to worship in the midst of it and victory came. Look at Joshua 6 - the children of Israel were at Jericho. What did God tell them to do? Shout against the walls of Jericho . Crazy right! Well, when they did, the walls fell down. In 2nd Chronicles 20 what happened when the King put the singers in front of the army? The enemies of the people of God fought among themselves and killed each other! Then they went into the enemies camp and took up the rewards. It's not easy to praise and worship during hard times. It takes a choice of your will to just do it. You need to remind yourself of all the times that God has come through before. You need to remind yourself that God is good for His word. So, in the midst of the struggle and the junk of life, stop complaining and begin to be thankful and worship God the best you can. It may just start as a thank you God or God I love you. Wherever you are - just start! So much has happened lately. My wife has been in the hospital and then the recovery process has been hard. She is not a person that is sick often but to have pneumonia and possible blood clots in her lungs has really been hard. But God is really good even in the midst of all this. Well, after 11 years of pastoring a church in St. Augustine, Fl, we get to start all over again. We have left the denomination we were a part of for the last 14 years. After much prayer and investigating the evidence we could no longer stand in integrity before the people and before God. So, we have begun a new work in St. Augustine called Christ the Deliverer. We are going to be an outward focused church-reaching out to the lost and serving St. Augustine. It is our desire to not just come to church but truly be the church. We want to change people's view about Christians and the church. We want to truly raise up "Christ Followers" who are impacting the society one person at a time. Over the next months I will tell of our journey as we reach out.